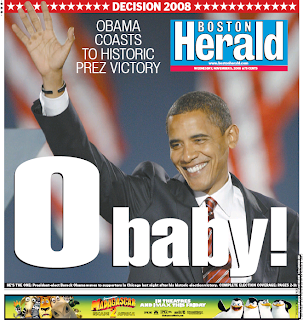 Newsifact: Helping newspaper editors with future Obama headlines. Helping newspaper editors with future Obama headlines. Obama does something to protect America: "Barack Ob-armour"
Obama reverses positions: "Backtrack Obama"
Obama's legislation fails to pass "Barack O'Bummer"
Obama goes to war: "Barack O'Bomber"
Obama goes on a hiking vacation: "Backpack Obama"
Obama charms a foreign leader: "Barack O'Charmer"
Secret Service hits Obama protestor: "Ba-Whack Obama"